Bike-O-Vision Live Strong, Stay Healthy! When You Win We Win! Please send us your wins. I wanted to take a minute to thank you for all the hours of riding pleasure you have brought my way. I am the proud owner of 87 of your videos and cannot wait for the next releases. Three weeks ago I suffered a heart attack due to a blockage. Fortunately, and mostly because I have been riding my stationary bike so much over the last year, I suffered no heart damage and am already back riding 10-15 miles a day as part of my rehab. I credit your work for keeping me motivated and excited about riding each and every day. Thank you for doing such a great job and offering such a great selection! I have had significant health challenges, including heart and lungs. And as I have been referred for a lung transplant, it is critical to continue to exercise to maintain and build strength and endurance as much as possible, especially with the transplant having been put on hold. I am, however, sensitive to climate changes, making outdoor exercise problematic during many months of the year, so I put my bike up on a trainer. While that has helped with the climate issues, I was losing interest, and reading wasn't helping, so a friend loaned me a couple of your DVD's. Now I find myself looking forward to the next ride, and also found some unexpected benefits. Though I'm viewing it on a fairly small laptop, I still manage to put myself into the videos so convincingly that I find myself leaning into some of the turns and braking as we approach stop signs. With all that focus on the DVD, I don't focus as much on shortness of breath or muscle weakness. That plus the imagined ride outside in the fresh air and actually going somewhere leaves me feeling a greater sense of accomplishment, health, and normalcy. Bike-o-vision is helping me to have home physical therapy to get better... "Hello. I have bike-o-vision videos and ride them every winter as I live in Iowa. This November 26th I dislocated my left knee. I am now doing physical therapy 3 x week. One thing they have me do at therapy is riding a stationary bike using my heel on the left pedal as I do not have full range of motion yet. I had my husband put my bike on the Cyclops and can do the same thing on my home bike. I am using it with my left heel only for short time periods like 10 minutes at the most. It is not easy but I am going to get back (with time and physical therapy) to riding the normal way. Bike-o-vision is helping me to have home physical therapy to get better. The physical therapist said it would be 12 weeks to full range of motion, now I am up to 4 weeks post injury. I will keep pedaling, Sabrina in Iowa"
Bike-O-Vision thank you for providing virtual cycling videos on Blu-Ray! "I wanted to get that out of the way first, because of my love for blu-ray. When it comes to virtual cycling videos the more realistic you can get the better. 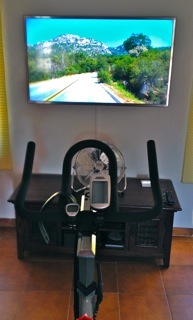 For me its helps me get into indoor cycling when i can totally immerse myself into the video." I love to use my stationary bike with the Bike-O-Vision dvds. "I just had to tell you that I really enjoyed the Grand Tetons, Wyoming dvd sent recently to me. I have a very bad knee and my knee has become much more limber since I have been using your dvds. I love to use my stationary bike with the Bike-O-Vision dvds. I recommend Bike-O-Vision all the time! I have been using the dvds along with a weight loss program and I've lost 14.5 lbs. I credit exercise with helping me keep motivated, too. I look forward to your next dvd." Cecilia Baker, Jackson, OH. ﻿﻿﻿"I've been telling everyone I know who exercises at home with a stationary bike, elliptical, or trea﻿﻿dmill, about your DVDs.﻿ My stationary bike is a good Schwinn model with on-board computer that offers lots of workout programs. I rode it most days and replayed my summer bike rides in my head (see attached pictures for samples) while I rode nowhere. But wasn't the same and I struggled to get my heart rate up and maintain it over time. In late January this year, Neil bought 4 Bike-o-Vision DVDs for me. I popped in St. Croix and I was hooked. On the first ride I got my heart rate up over 140 and rode hell-bent for leather for the full 74 minutes. After that, I was hooked. I couldn't wait to get up and ride. It was no longer a ride to nowhere. Now I was riding somewhere. I was riding around Death Valley, Yosemite, and Florida. The quality of the pictures is amazing, clear and colourful, and I'm watching these on a big flat-screen TV. It's not just the pictures though. I've graduated to knowing that it's the music that gives me the best workout. In fact, I've started to mute some of the DVDs with the more passive music, while I play the music CD, or even one of the other DVDs with a better beat (Zion Nat'l Park has the best music), while I ride. Needless to say, all this biking has a wonderful side-effect, weight loss. In May we took a two-week trip to London and Naples. So in January I started really working at losing weight before the trip. My version of "packing light". I figured I could lose 10 lbs, but secretly hoped to lose 15. I lost a couple of lbs in January, cycling for 2 hours a day, to nowhere. But then I got your DVDs. Well, I took two DVDs a day, and thanks to Bike-o-Vision I lost almost 2 lbs a week. When I left for the trip I was 20 lbs lighter. My exercise routine is now a simple one. Take 2 DVDs a day to lose weight. Take 1 DVD a day to maintain weight. An excellent indoor alternative to outdoor cycling. "This is the first Bike-O-Vision DVD that I purchased, and it's definitely my favorite! Zion's National Park and the surrounding area in Southern Utah has some of the most beautiful scenery on earth. As a road cyclist, I bicycle commute and tour over 3000 miles per year. For wet or wintery days, this DVD is an excellent indoor alternative to outdoor cycling. The idea is to incorporate this video into a bicycle touring simulation, and make it as realistic as possible. I play this DVD in a portable DVD player on my recumbent style stationary bike's book stand (so the screen is right in front of my face). The closer you can get to the screen, the more realistic it will seem, and the easier it will be to get into the "zone". Using this DVD, I am able to really focus on my workout and enjoy the scenery... just like a bike tour (whereas, when I worked out to a movie, I'd tend to get distracted and lose my intensity and technique). Personally, I really like the music! This DVD includes a great variety of instrumental style music. However, others may prefer to work out to their own music. If this is the case, just turn down the volume on the TV, and crank up whatever motivates your workout. The value of this DVD far surpasses the selling price based on the video alone! ﻿﻿Keep up the excellent work. ﻿﻿ "I first heard about your videos while searching online for such a product. Something that would give me incentive to ride the exercise bike that I recently purchased. It does a really good job of that. I especially enjoyed the Tenn. and North Carolina rides. Oregon's scenery was spectacular. I know this is the only way I would ever get to ride a bike in that area. Also, the Fredericksburg, Va. portion of another tape (I live close to Fredericksburg and also work there) was of special interest to me. I like the angle of the camera shot making it realistic enough to imagine that you really are riding in these areas. Keep up the excellent work. I look forward to what you may offer in the future." Phyllis, Woodford VA.
"A FANTASTIC EXERCISE PROGRAM!! I think it fitting to write and tell you the money I spent on Bike-O-Vision was one of the soundest investments I ever made. I purchased good health and enjoyment at the same time. I experienced the joy of cycling through wonderful places I have never seen and am unlikely to see, to the sound of music I have never taken the time to listen to before. I find that I spend much more than the allotted exercise time on my stationary bike with the Bike-O-Vision program, because it's fun doing so. I am in a sedentary situation, and never will get my proper exercise on the job; now I do get much more exercise and find my self looking forward to it every day. I hope to exercise with more sights that Bike-O-Vision can offer without ever leaving my livingroom. CONGRATULATIONS ON A NOVEL AND HEALTHY APPROACH TO GOOD HEALTH!!" Ted Mayhall, Citrus Springs, Fl. "Best cycling video selections I've seen online and at a great price too. I cycle a lot and this is definitely the way to go. Really perfect for rainy days when cycling outside is impossible." Thanks! Matt Bradshaw, Petaluma, CA. I love all the DVD's I have received so far. "I'm glad to hear that the LA/San Diego DVD is going to be available soon! I love all the DVD's I have received so far. I have all of your DVD's that focus on the West Coast (California). I'm mainly interested in the areas of the U.S. that I have already traveled to, or would like to travel to, which includes the West Coast states mostly. The quality of the DVD's you have already released are as good as they could possibly get --- excellent! I love them!" William Vogel, Dixon IL. "I just wanted to tell you of a fringe benefit Bike-O-Vision has given us. My children, who used to consider the study of world geography an unpleasant subject they had to cope with, now can hardly wait to climb aboard our exercise bike with the Bike-O-Vision program to start new trips through different countries. 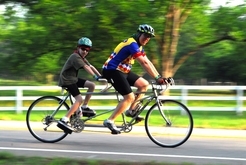 We may have to buy other bikes, so we can all share the fun." Jack Goldman, Valley Stream, N.Y. In our favorite 2009 comedy, "The Proposal", Sandra Bullock plays Margaret Tate, a successful, self-made chief-editor of the Ruick & Hunt Publishing in New York City and the first scene opens in Margaret's apartment, the epitome of Manhattan chic - impeccable, sleek, expensive. Margaret is astride an indoor cycle, pedaling in perfect sync to the video on the flat screen monitor in front of her.... So, was it a Bike-O-Vision journey? We've been asked this question many times since the movie's release. The answer.... well... almost, because "mimicry" is said to be the highest form of compliment so even though Disney Studios did not use our specific video clip they created one their own based upon Bike-O-Vision's virtual cycling journeys. Thank you for the compliment Disney Studios!! And, if you haven't seen the movie yet, we highly recommend it for their well directed movie humor and laughs.